Normally people associate champagne with a fancy event or celebration like a wedding or anniversary, but I actually think it makes the perfect pre-dinner drink when meeting up with friends. It is light and refreshing and I always feel a little bit fancy when drinking it even if I am just in jeans and a tee shirt. Today I stopped into The Daily cocktail bar located in the Nolita section of soho. 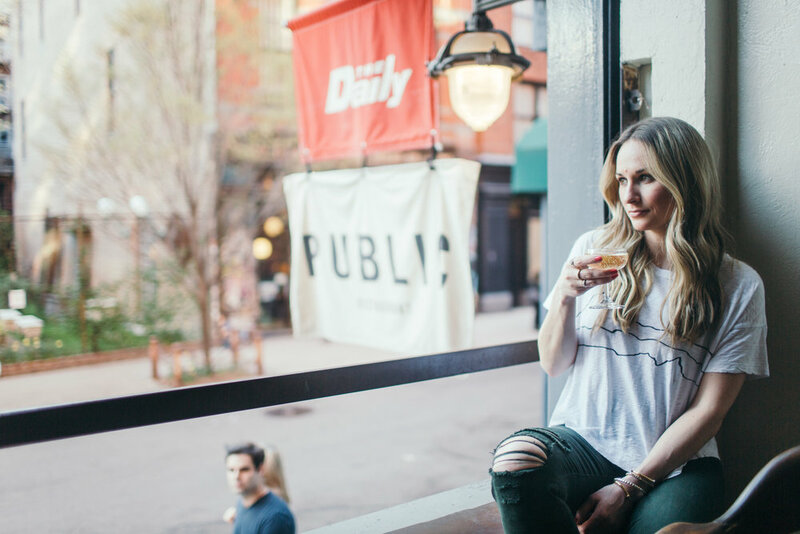 This bar is a neighborhood staple and is the perfect place to stop into for a drink. The inside decor is dark and comfortable reminiscent of the 1800's. The menu has classic staples and five cocktails that change daily which are modern interpretations of classic cocktail categories such as “Stirred Down,” “Bottled,” “Improved” and “Short." On this visit, the weather was just starting to change and it was still early enough in the evening that I sat out in the open air seating area. This is a great place for a catch up and has something for everyone. The dress code is casual so I wore a simple Rag & Bone tee with J brand destroyed skinnies. Cheers! This is a great balanced champagne that had the perfect combination of fruitiness and bite. I don't like super dry champagne and I found this one to be just right. I would highly recommend this bottle for your next event!